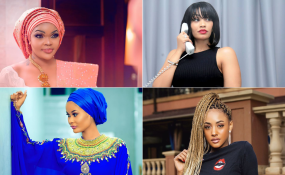 From top left clockwise: Wema Sepetu, Zari Hassan, Hamisa Mobetto and Tanasha Donna. In the African setup, when a man introduces his girlfriend to his parents, it's usually a sign that he is keen to take the relationship to the next level - which is marriage. It's a move that many interpreted as Diamond's way of setting the pace to the much anticipated wedding, which the artiste has bragged will be attended by international stars like Omarion, Rick Ross and Morgan Heritage, if and when it happens. However, if his past love life is anything to go by, then it's no guarantee he will end up marrying the Kenyan beau. 1. Wema Sepetu - Diamond and Wema dated for the longest time anyone can ever remember. Back then, they were said to be the hottest couple in bongo music. Over the years they had an off and on relationship and at some point they split after Diamond cheated with Wema's close friend Jokate Mwengelo, now the Kisarawe District Commissioner in Tanzania. The singer went on to introduce the actress to his mother long before he became rich and popular. Sanura has often been quoted saying he would have wished to see his son marry Wema. However, that never happened as Diamond dumped Wema in 2014 for good, just months after getting back together. Todate, Sanura remains very found of Wema. 2. Zari Hassan - After dumping Wema, Diamond started dating the Ugandan socialite. The two dated for about four years and during that time they were blessed with two children. Diamond also got to introduce Zari to his mother. However, Sanura wasn't as fond of Zari as Diamond's elder sister Esma Khan. It has been reported that Sanura felt the 38-year-old Zari was too old for his 29-year-old son. In February 14, 2018 Zari made it public that she had dumped Diamond over his infidelity. But just before the split, Zari and Diamond had talked publicly in several interviews about having a mega wedding. It never came to be. 3. Hamisa Mobetto - After Zari dumped Diamond, the singer rekindled the flame with his baby mama Hamisa Mobetto with whom he cheated on the socialite. The two had a son and Hamisa was convinced that with Zari out of the picture, Chibu would finally wed her. Hamisa was introduced to Diamond's mother and elder sister Esma. Hamisa enjoyed a cordial relationship with Sanura, whom Diamond actually sent to check on her at the hospital when she delivered their son as he was out of the country at the time. Their romance was however short-lived and their sweet love turned sour when rumours emerged that Hamisa was trying to lure Diamond to marrying through witchcraft. 4. Tanasha Donna - She is the latest to be added to the list of women Diamond has taken home to his mother. Tanasha met Diamond two years ago at a club but they only started dating sometime late last year before they made their relationship public. With their planned wedding now postponed, it remain to be seen if indeed Tanasha who will succeed in dragging Diamond down the aisle.